This lesson identifies the mathematical definition of harmony as it relates to sounds which do and do not go together. Although the definition of a normal sound may change over the years, the math concepts which form the basis of all music remain the same. The lesson demonstrates how linear tones, the division of octaves, and the ratios used to describe chords are all used to create songs. 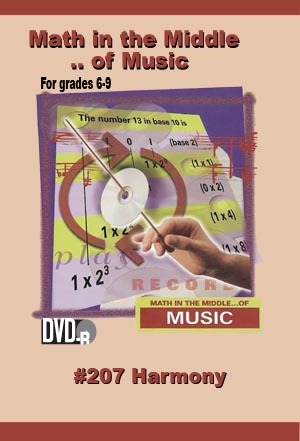 • Discover how songs are created from mathematically related notes. • Use ratios and proportions to understand how combinations of notes create pleasing and not so pleasing sounds. • Learn how arrangements of tones allow us to create melodies and harmonies. Rights granted include: a) life of media audiovisual use, b) public performance, c) campus or building closed circuit and digital/video-on-demand transmission. Broadcast, cablecast and telecourse rights are also available. Email slenzen@shopdei.com for pricing.